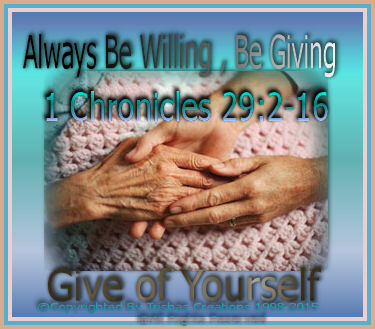 "Always Be Willing , Be Giving"
Welcome to "Always Be Willing , Be Giving"
Have you noticed that people are not as willing to be willing of giving of what God has blessed them with? So many think they have what they have because of their works and ability…. But they are wrong. I was always taught all good things come from God above. So, are they wrong to think that all they have is from their works and ability? I have to say, yes they are wrong for thinking such a thing. If, it wasn’t for God they wouldn’t have what they have if it wasn’t for God. All good things come from above, jobs, money, housing, clothing, cars, boats, yes a man or woman. When we do the will of God, and He blesses us with so many blessings because we are doing His will, and doing all that He wants us to do, and including trusting in Him, Loving Him, having Faith in Him, and with Him, we follow His word, He Yes He blesses us, beyond anything we could ever imagine. But, most people ridicule those who God has richly blessed. He’s blessed them with family, cars, the works –– but yet they get talked about badly to other’s other’s from other’s and they look down on them and they get judged by other people. God, tells us in the Bible if we live for Him, follow Him and His word and do His commandments and do His will, we all shall prosper, we will live in prosperity. We all need to give of what God gives us, He Blesses us even more and we should and supposed to give from all that He blesses us with. It came from God in the first place, it was His from the get go. We have to be willing to give from what God gave us to other’s, we are NOT supposed to be greedy with anything, from nothing we are given and blessed with. Heres and example : You enjoy being given to right? Well, God enjoys giving to those who are willing to give to Him, or give to other’s. Because, whether you realize it or not, what has been given to you, surely can be stopped or even taken away from you. Why? Because you’re not being a willing vessel, you are not willing to give to God out of what He has given to you, we should give to Him or other’s from what He blessed us with. When we give to even other’s in need, we are still giving to God, by helping other’s. WE must be willing to be giving to be giving in our willing. It could be anything, it doesn’t have to be money, there is many ways you can give from what God has given you, whether it be money, or just love and showing you care about them. Also, God knows your heart before you do ahead of time. He knows, if you want to or don’t want to. He knows whether you are giving to procrastination before hand or not, He knows just how willing you will be, and yes how willing in what you won’t. When, you don’t and aren’t God knows the love you have for Him, and again Yes, the love you don’t have for Him. God, love you enough to bless you and give His son, and all that He has given you with what you have, and He is aware of how much you will show it, by giving to Him of yourself and what He has given you. It doesn’t matter if it’s just some clothes you have laying around or maybe some books, or tapes, etc. There is always someone in need somewhere to give to. He gave each one of us a giving heart and a willing heart, and spirit of willingness to give and it’s entirely up to us as what to do as He wishes for us to do –– for Him!